Delicious French Toast made on your grill! 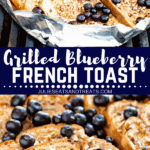 This Blueberry French Toast is grilled so you don’t have to heat up your kitchen and can make it while camping over a campfire too! 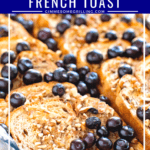 The hint of cinnamon and juicy blueberries and crunchy pecans will make this your new favorite french toast recipe! 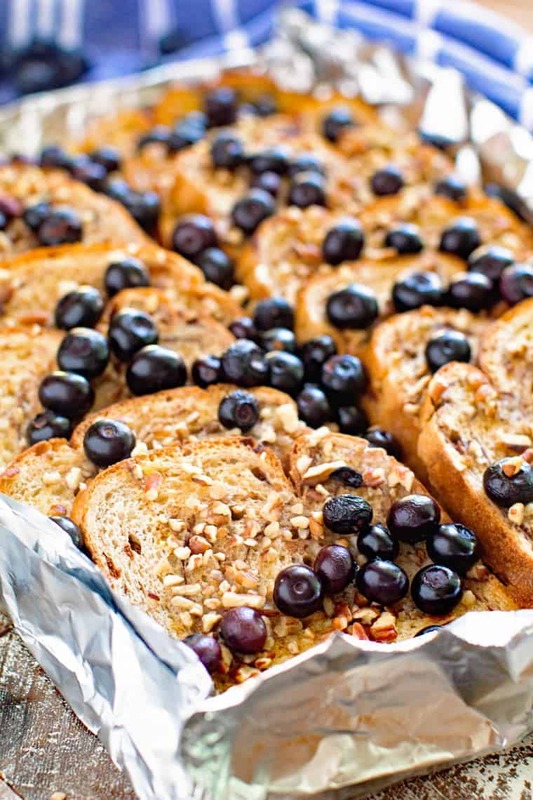 Imagine french toast, bursting with plump, juicy blueberries and crunchy pecans. Now, imagine doing this while camping! 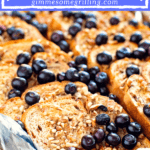 It’s so easy to make and such a fun breakfast that can be made on the grill or campfire. 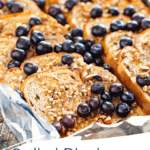 Mix up your camping breakfast with this Blueberry French Toast recipe now! Have you been camping yet this summer? The kids love it! I love it too, but you know what I don’t like… cleaning up a bunch of pans when breakfast, lunch and dinner is over! It’s like my job is never done! Story of a Mom’s life, right? I feel like I’m stationed in the kitchen over the sink half of the day. I’m one of those weird people that HAS to do dishes after every meal. I hate going to bed with the dishes dirty. Are you like that? 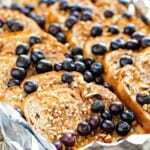 Here’s my easy fool-proof method of making the BEST Blueberry French Toast right on the grill! It’s easy to make using indirect heat and so delicious! Let’s face it, juicy blueberries and crunchy pecans with just a hint of cinnamon? Mmmmm!!!! Everything tastes better on the grill, don’t you agree? This would even be fun to make when the kids are having a sleepover! 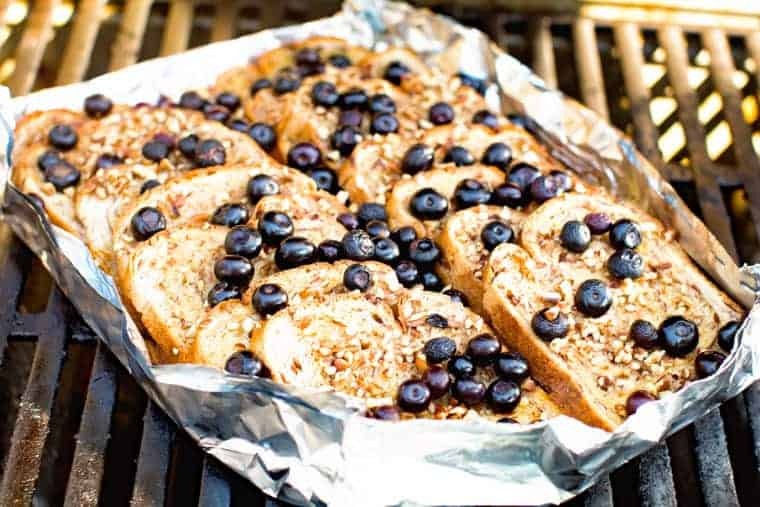 On the grill, campfire or in the oven French Toast is always a family favorite! My oldest daughter was begging for this the next morning after we made it. Apparently she has a love of French Toast I never knew about! Trust me, I’m just fine with this! 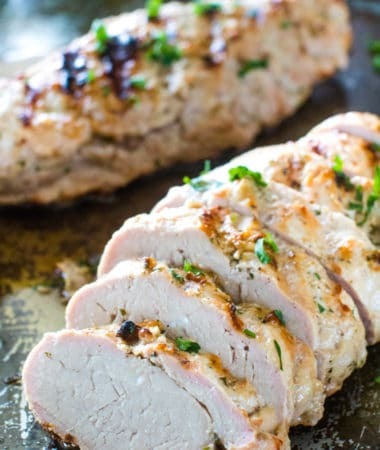 The method used to cook this meal is indirect heat. Indirect heat is a technique where the food is placed to the side of the heat source, rather than directly over the flame. If your grill has three burners light the outer two and place the foil packet in the middle to cook. If you’re camping, move the foil packet to the side so it’s not directly over the flame. Here are more great options to serve with this meal! Prepare campfire or preheat grill to 350 degrees. Create a “pan” with heavy duty tinfoil, be sure to double thickness. Arrange bread slices on the greased pan . In a small bowl whisk eggs, milk, syrup, cinnamon and vanilla. Sprinkle with nuts and blueberries. Place on grill using indirect heat or over campfire on a grill grate. Bake until it is cooked through and the egg is “set”. (You may want to rotate this if one side is cooking hotter than the other). Remove from grill or campfire and let stand for 10 minutes. Your kids (big and small!) will love this meal – you will too and cleanup is a snap! I know it’s going to be your new favorite French Toast Recipe! So be sure to give this one a try, don’t forget to share a picture with #gimmesomegrilling or on Instagram at @gimmesomegrilling! If you have a moment, be sure to leave a five star rating below, I’d really appreciate it! Delicious French Toast made on your grill! 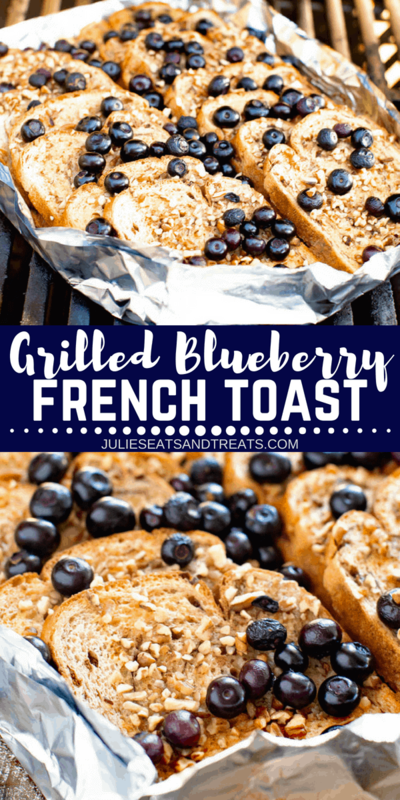 This Blueberry French Toast is grilled so you don't have to heat up your kitchen and can make it while camping over a campfire too! 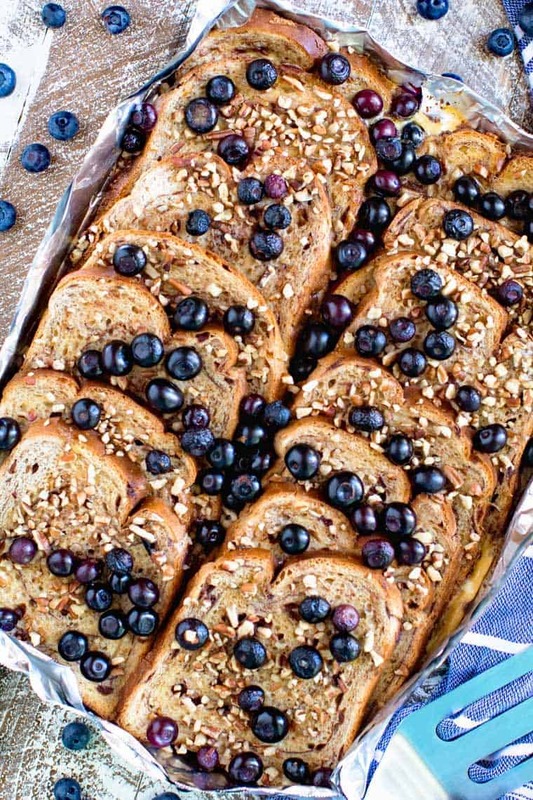 The hint of cinnamon and juicy blueberries will make this your new favorite french toast recipe! Prepare campfire or preheat grill to 350 degrees. If you are grilling this you will want to use "indirect" heat. If you have three burners turn the two outside burners on and put this in the middle. Essentially where this is cooking you do not want to have that burner on. 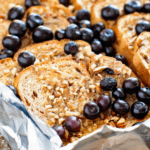 Arrange bread slices on greased heavy duty tinfoil, double thickness. You want this to be about 24'' x 18''. 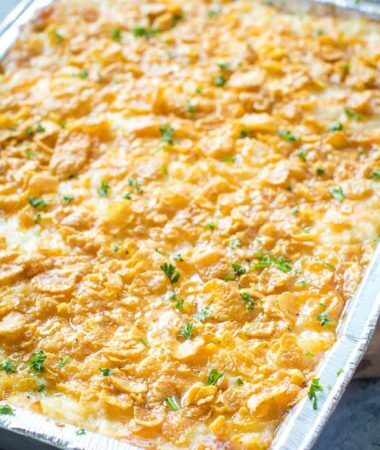 Bring foil up on sides to make a "pan". In a small bowl whisk eggs, milk, syrup, cinnamon and vanilla. Pour mixture over the bread. Sprinkle with nuts and 1 c. of the blueberries. Place on grill using indirect heat or over campfire on a grill grate. Bake until it is cooked through and the egg is "set". 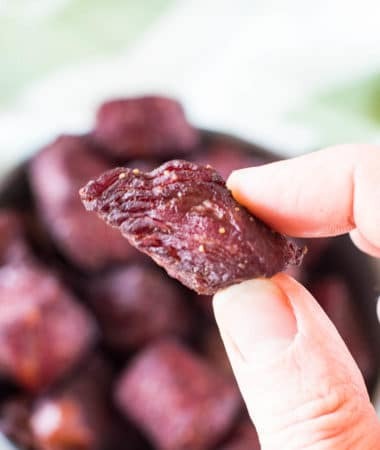 This will take about 30-35 minutes depending on temperature of your campfire or grill. You may want to rotate this if one side is cooking hotter than the other. Remove from grill or campfire and let stand for 10 minutes. Sprinkle with remaining blueberries and serve with additional syrup. This can also be made in the stove. Preheat oven to 350 degrees. Place foil packet on a large baking sheet and baked for about 30 minutes or until heated through and eggs are "set". Let stand 10 minutes and sprinkle with remaining blueberries. Serve with syrup. I love French toast. Looks so delicious with all these blueberries – yum! The blueberries take it over the top! What? I’m so glad you finally found this slice of heaven!